Question: Why would the Feds want to increase interest rates? See end of article for the answer. Back in the mid-1970’s, most large companies provided their employees with pensions to care for them in retirement. In the mid-1980’s, most retirees owned their houses and had fewer financial assets. Yet, their pensions were adequate to cover the gap between maintaining their lifestyle and the amount of social security received. According to the 2010 U.S. Census, personal investment assets have increased from $14 to $47 trillion since 1990. Retirees may have more in investment assets in 2015, but the returns from those assets are less assured than pensions were in the mid-1980’s. 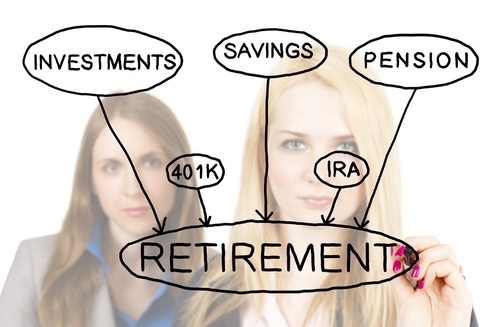 The shift from pensions to IRAs, 403(b)s or 401(k)s has put the burden on the individual to save and invest wisely. How much money will you need? A good rule of thumb is to figure out how much you’ll need per year, add a zero to the end of that number, and then double it. For example, if you expect needing $100,000 per year in retirement, add a zero to make it $1 million and then double that for $2 million. So by the time you retire, you should plan on having $2 million in investments. Both individuals and fund managers have significantly reduced their investments’ holding periods. The world of investing has changed a great deal since the 1940’s. See Exhibit. 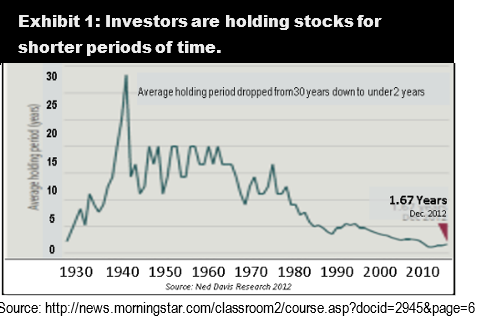 From 1940 to 1960, holding periods averaged more than 15 years, peaking at nearly 30 years. In 1985, the average investor held an investment for four to five years. In 2014, the average holding period dropped to 1.67 years. Over the same time, fund managers reduced their holding periods to just 1.02 years. As the world increased in pace, investments have to be changed more often. Just since 2008, the amount of phone data has increased twenty-fold, requiring investment strategies to adjust to a changing world economy much more swiftly. Our cell phones and other (Personal Digital Assistants) PDAs are now as powerful as a computer, keeping us up-to-date, minute-by-minute to world events. While this is very useful, it could make declines in the market much faster than in the past. 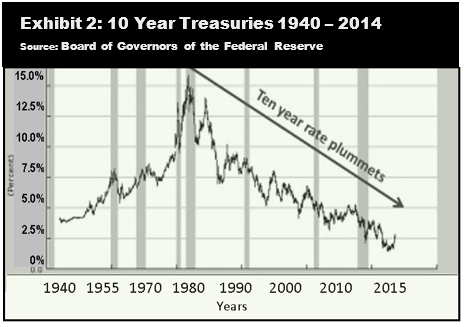 Another way investing has changed is in interest rates. Exhibit 2 shows the decline in interest rates since 1981.
less than five percent. As a result of this drop in overall interest rates, interest bearing investments like bonds, real estate, and stocks did very well. So why would the Fed want to increase interest rates? The U. S. Government is the largest pension provider in the world, and if interest rates go up, they will be able to fund their pension liabilities with less money. They will also reduce the costs relating to the U.S Pension Benefit Guaranty Corporation (PBGC) which protects the retirement incomes of more than 44 million American workers. Many are underfunded and PBGC just doesn’t have enough money to bail them all out. The study was largely compiled before the Multi-Employer Pension Reform Act of 2014 was enacted in December 2014. The new law allows some troubled multi-employer plans to adjust benefits to keep the plan solvent, as long as they remain above the PBGC guarantee level, but it did not change the amount of the PBGC guarantee, which is based on a plan’s benefit accrual rate. “The guarantee itself is going to be less and less effective,” the official said. The study did not factor in the agency’s projection that the multi-employer program will run out of money itself within a decade. Figures released June 17th, 2015 by the Congressional Budget Office project that the PBGC Multi-Employer fund will be exhausted in 2024. In conclusion, with the investment world changing much faster, investors need to change their approach, depending on outside factors, including current interest rates, Fed policy and world events. Answer to the Question: Why would the Feds want to increase interest rates? By increasing the interest rates from 3% to 6%, employers would need half the money to provide the same pension income. As a result, an interest rate increase is aligned with the interests of the Fed, employers and the U.S. Government. Brett Machtig has authored several books and is the founding partner of The Capital Advisory Group Advisory Services, a private asset management and retirement planning services firm located in Bloomington, MN. Their firm manages more than $400 million in assets for 83 institutions and about 850 families as of December 31, 2014. He has been helping affluent investors execute financial strategies, meet income objectives and realize life visions for more than 30 years. Approachable, genuine and down-to-earth, Brett holds himself to a high standard of accountability and seeks to achieve positive financial results on behalf of each client. In this article, Brett shares the effectiveness of each strategy and how to improve it. The information contained does not constitute an offer to buy or sell securities and is provided for illustrative purposes only. The information comes from reliable sources, but no guarantees or warranties are given or implied to its accuracy or validity. The strategies listed do not necessarily reflect those of its publisher, MGI Publications or its authors. Information obtained from publicly available sources listed herein and footnoted where applicable. Securities offered through United Planners Financial Services of America, a Limited Partnership, 480-991-0225 member FINRA/SIPC, 7333 E Doubletree Ranch Rd, Scottsdale, AZ 85258. Advisory Services offered through The Capital Advisory Group Advisory Services, LLC 5270 W. 84th Street, Suite 310, Bloomington, MN 55437, 952-831-8243, an independent registered investment advisor, not affiliated with United Planners Financial Services of America. ADV, Part 2A as of 3/26/2015, available upon request. Many investments are offered by prospectus. You should consider the investment objective, risks, and charges and expenses carefully before investing. Your financial advisor can provide a prospectus, which you should read carefully before investing. An investment in a money market fund is not insured or guaranteed by the Federal Deposit Insurance Corporation (FDIC) or any other government agency. Although a money market fund seeks to preserve the value of your investment at $1.00 per share, it is possible to lose money by investing in a money market fund. Diversification does not guarantee a profit or protect against loss. Please consult your attorney or qualified tax advisor regarding your situation. Asset allocation and rebalancing do not guarantee investment returns and do not eliminate the risk of loss.